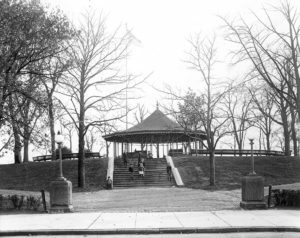 The pagoda at Riverside Park in the early 20th century. Join us on a walking tour of two Olmsted-designed parks in South Baltimore. 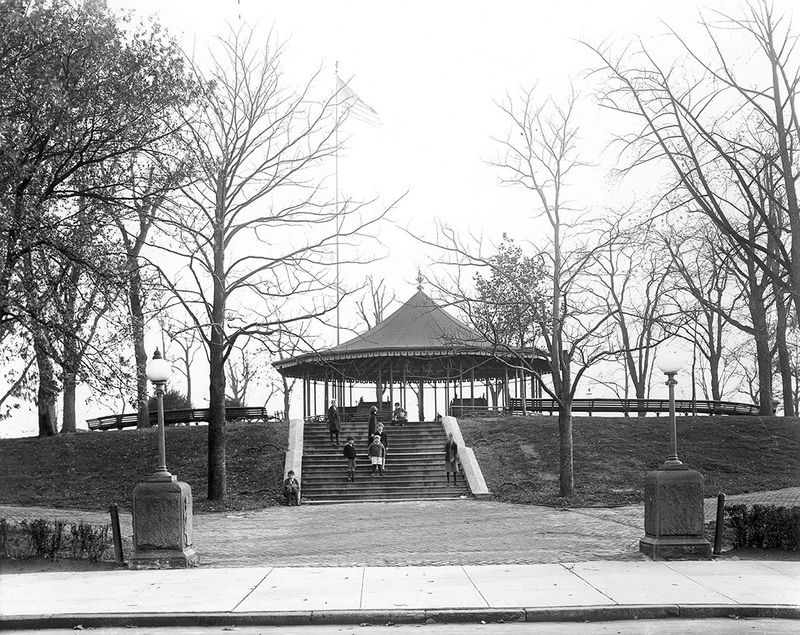 Riverside Park evolved from land critical to the defense of Baltimore during the War of 1812 to a public park and gathering space for the surrounding community with the later addition of a pool, playgrounds, sports fields and its trademark gazebo. 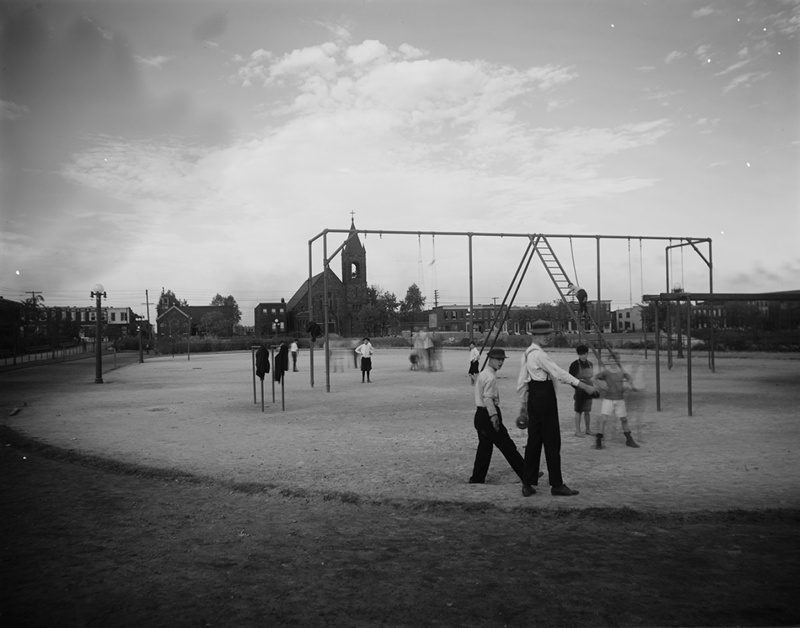 The original playground at Latrobe Park. 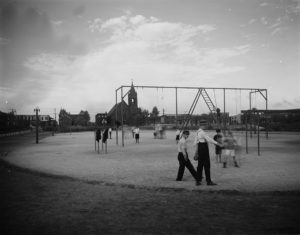 Designed in 1904, Latrobe Park on Fort Avenue is one of the most fully-realized Baltimore parks planned and developed by the Olmsted Brothers Landscape Architects in response to the Recreation and Playground movements in the early 20th century. Significant improvements at both parks demonstrate recent strong community partnerships. The tour will consider the long histories of both parks and their current roles in Baltimore’s urban peninsula. NOTE: Meet at the Gazebo in Riverside Park starting at 1:45 pm. There is free parking on the streets adjacent to the park. 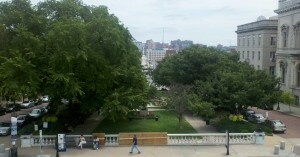 (E. Randall St., Johnson St., and Covington St.) This park is also near bus routes and bike routes. After the tour of Riverside Park, carpool to Latrobe Park. At the end of the tour, we will return to Riverside Park. Tour leaders: Ed Orser and Lauren Schiszik, FMOPL. Tour presenters: Kate Brower and Adam Boarman, City Department of Recreation and Parks; Jackson Fisher, Friends of Riverside Park, Scott Huot, Riverside Park Community, Jillian Storm, author of “Latrobe Park”, The Olmstedian. New spring walking tour of Clifton Park on May 4!